The easiest and most common way of making a planned gift is through a bequest in your will. You can designate a specific amount of money, a percentage of your estate, or a specific asset. 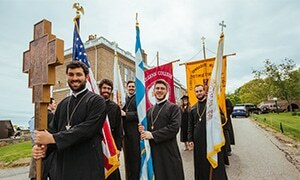 Hellenic College Holy Cross could also be named as a contingent beneficiary. Gifts such as a charitable gift annuity or a charitable lead trust provide you and/or your designated beneficiary income for life. Upon your passing, HCHC receives the gift. Life insurance can be used to make a sizeable gift to Hellenic College Holy Cross. You can deed your home, vacation property, or condominium to Hellenic College Holy Cross and retain the right to live in the property and/or receive income from the property for as long as you or your beneficiaries live. By naming Hellenic College Holy Cross as the beneficiary of the remainder after your death and/or the death of your spouse, 100 percent of the plan’s benefits would avoid both income and estate taxes. An outright gift of appreciated property, such as publicly traded securities or closely held stock, provides an extra tax benefit if you have owned the asset for more than one year. Any type of property, including cash, securities, real estate, and works of art and jewelry, among others, may be given to Hellenic College Holy Cross through you will. For more information, please contact the Office of Institutional Advancement.